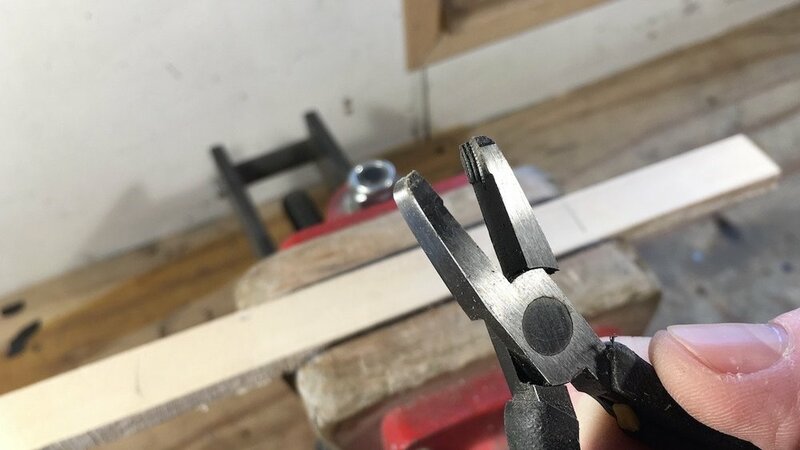 Last time I talked about some methods for removing a worn screw from your guitar. We discussed a couple of options but, mainly, we focused on cutting a new slot in the screw-head to allow a screwdriver purchase. Well, that’s fine. It works great in many circumstances. Sometimes, it’s not possible to get enough access to cut a new slot in the head. Or sometimes, it just plain doesn’t work — you still can’t get the damn screw to turn. Another option is needed. And while there are some ‘worth-a-try’ methods (more later), there’s a very good chance you’ll end up drilling. Let's assume we’re talking about a pickguard screw, or one holding something ‘raised’ off the guitar — say it’s a tuner screw, a pickup mount or cavity cover screw, that sort of thing. Using a drill bit that’s a little smaller in diameter than the screw head, begin drilling straight down onto the head of the screw. If you don’t have a nicely defined centre, start drilling with a much smaller bit and make a small pilot hole (not really a hole — more of a pilot crater). Step up through bit sizes to gradually enlarge your pilot crater until it can accommodate the bit you need. In the image above, I've stepped through a couple of bit sizes and will go up another size from this one to do the final drilling. 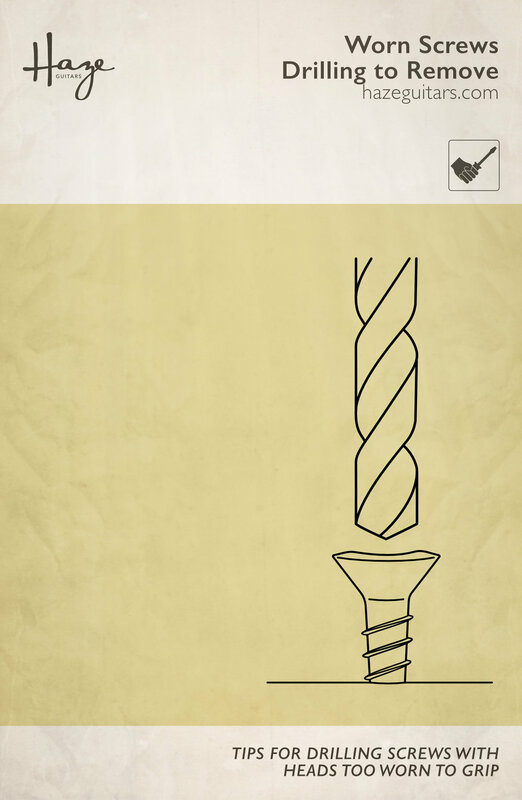 You’re not trying to drill all the way to the bottom of the screw. What you’re aiming for here is just to remove the screw head. The idea is that when you drill through the head with a sufficiently large bit, the head will eventually be all but gone. With just the shaft left (maybe with only a little of the head), the pickguard, tuner, cover, whatever can be removed. This leaves a small section of shaft poking out of the guitar. You can grip that shaft with your very special pliers (they really are better at this job than a normal pliers). Say hello to my little friend, the screw removal pliers. Get these at StewMac or at Amazon (US | UK) (affiliate links — learn more) or probably lots of places. If all is well, you’ll be able to grip that screw shaft and turn it until you can extract the screw and dump it. Grip what’s left of the screw and (hopefully) you can get it extracted. Of course, if all is not well, there may be even more drilling in your future. And mine. More next time. The first is one sent to me by my old buddy, Ivan. He tells me that he has often been successful in removing a worn screw by using a strong 2-part epoxy and epoxying something to the screw head. Once the epoxy is cured, it’s possible to grip this new screw ‘hat’ with a pliers and turn the screw. I haven’t tried this but I’m definitely intrigued. I suspect I’ll give it a go in the future. A word of caution: Use good epoxy. Don’t go cheap and don’t go fast. I’ve never found the quick-curing stuff to be super strong, and the cheap stuff is generally pretty poor. Give it go. If it works, I’ll send Ivan a voucher, redeemable for a small bottle of beer (only one voucher per tip). Thanks, Ivan. The second alternative was a tip from Sam. Sam tells me that a product called EZ Grip can really help give a screwdriver some extra purchase on a worn screw. I’ve had a look at their web site and was intrigued enough to order a bottle. Their Aircraft Grade product specifically states it has no silicone so that’s the one I went for — never like getting silicone around guitars if I can help it. You can take a look at https://ezgrip.net if you like. Joey was good enough to remind me about the rubber band trick. This is (I think) essentially the same principle as the EZ Grip but has the benefit of just needing a rubber band instead of a bottle of microscopic, magic, metal cubes. Use a wide rubber band and stretch it over the screwdriver tip. The rubber compresses and pushes into any tiny notches in the worn screw head and might just be enough to get a grip. Definitely worth a try.